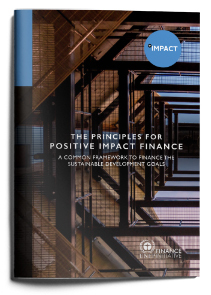 The Positive Impact Initiative is driven by a group of UNEP FI members seeking to establish a new financing paradigm based on a holistic appraisal of impacts to the three pillars of sustainable development. This is seen as the key to the twin challenges of future-proofing business and achieving the Sustainable Development Goals (SDGs). The Principles were launched in Paris on January 30th 2017 and it provides guidance for financiers and investors to analyse, monitor and disclose the social, environmental and economic impacts of the financial products and services they deliver. They provide a global framework applicable across different business lines, including retail and wholesale lending, corporate and investment lending, and asset management. The Principles require a holistic appraisal of positive and negative impacts on economic development, human well-being and the environment: this is what makes them innovative. Following the launch of UNEP FI’s Principles for Positive Impact Finance by French Finance Minister Michel Sapin and 19 leading banks and investors, the strategy for the Positive Impact initiative has been defined and you are invited to join a webinar on Wednesday 10 May where the strategy and work programme will be presented. Participants will have the opportunity to find out more about the range of options available to participate in the initiative and contribute to the financing of the Sustainable Development Goals. Join the following members of the Positive Impact Finance Steering Group and UNEP FI’s secretariat to ask questions and provide feedback. To find out more about Positive Impact before the webinar and send us questions in advance, please visit: http://www.unepfi.org/positive-impact and email positiveimpact@unepfi.org. The webinar was offered twice on Wednesday 10 May, at 9am and 4pm CEST.